The last few months have seen a lot of firsts for me: Korean barbecue, sake, climbing over public barriers.. Why not add Ethiopian food to the list. Tonight I went to Addis in King’s Cross with a friend. He had been before and warned me that it took him a while to get used to the food. It didn’t fill me with confidence but I was definitely intrigued. Ethiopian cuisine characteristically consists of vegetables and often very spicy meat dishes, usually in the form of wat (also w’et or wot), a thick stew, served atop injera, a large sourdough flatbread, which is about 20 inches in diameter and made out of fermented teff flour. Ethiopians eat exclusively with their right hands, using pieces of injera to pick up bites of entrées and side dishes. 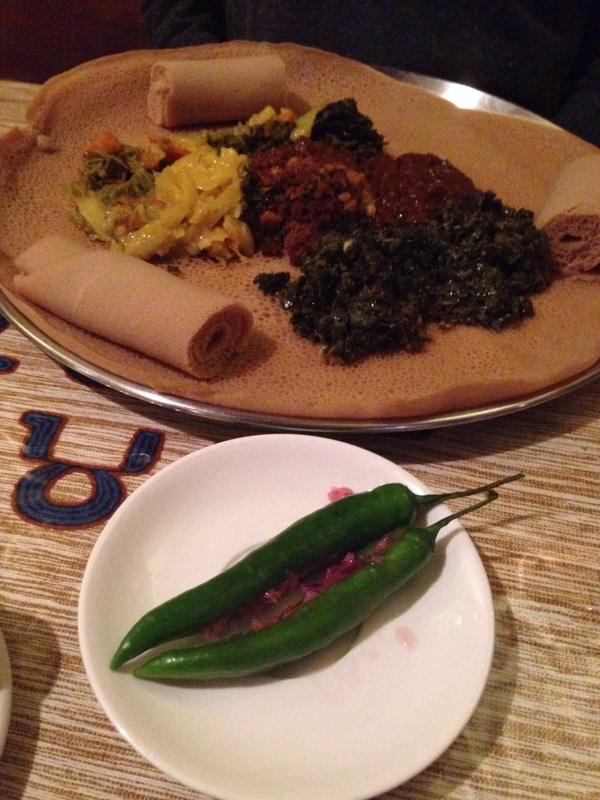 Utensils are rarely used with Ethiopian cuisine. I’d say Wikipedia is pretty spot on! Our injera arrived a little while before the rest of the food and I had been advised not to eat the injera on its own as it doesn’t taste great. Obviously this added an element of forbidden mystery so I had to try it. He wasn’t wrong. It tasted like a sponge that had fallen in a puddle of vinegar. It was brought to my attention that what is served in the UK is the mild version; in Ethiopia it will be far more pungent. I’m a big believer in sharing, so since my friend is vegan, our meal was vegetable focused. This put the food to a tougher test; can the vegetables be tasty enough that I didn’t feel I missed out on meat? We ordered spinach wot, misser wot (spicy lentils), yetesom beyaynetu (mixed vegetables) and green chillies stuffed with onion and tomato. Chillies excluded, the dishes were all of a stew consistency. I started out daintily placing the food onto the injera with a fork until the waitress came over and pointed out my mistake. 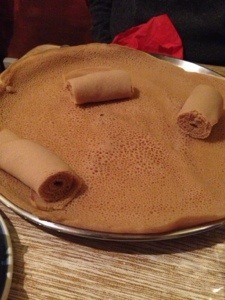 I quickly got the hang of tearing off a bit of the injera and using it to pick up mouthfuls of food. It was surprisingly unmessy, and as soon as you add food to it, the injera transforms and becomes more of a bland (in a positive sense) accompaniment. The spinach and mixed vegetables were very flavoursome (and did pass the meat substitution test) but my favourite was the lentils; they had a real kick but weren’t overly spicy, unlike the chillies. I was naive in thinking I could handle one, I couldn’t and won’t be biting into a chilli again in a hurry. At £13.50 each, including a delightful mango juice, Addis is a bargain! I very much enjoyed my first Ethiopian dining experience and recommend it to those who enjoy spicy food and getting stuck in with your hands.